The Leonids (Leonid meteor shower) are an annual meteor shower occurring in November. They are called Leonids because their radiant lies in the constellation Leo. The Leonid meteors are associated with the comet Tempel-Tuttle. They appear to originate from a point in the sky near the bright star Algieba, Gamma Leonis. The Leonids peak on the night of November 17 to 18 this year, but will be visible on several nights before and after the date. The peak itself can change from year to year. The meteor shower generally lasts from November 13 to November 21, but meteors can hardly be detected on these dates. A meteor shower occurs as a result of Earth moving through a stream of particles left behind by a comet. These particles, called meteoroids, are ejected by the comet as it comes closer to the Sun and its frozen gases evaporate, leaving behind a trail of solid particles which continue on the comet’s orbit. The Leonid meteoroids move very fast as they come into the Earth’s path, with an impact speed of 71 kilometres( 44 miles) per second. The meteor shower can leave behind 12 to 13 tons of particles across our planet every year. Larger meteoroids are only about 10 milimetres across, with a mass of half a gram, yet they can generate very bright meteors, with a visual magnitude of -1.5. In 2014, there will be about 15 to 20 meteors per hour at peak, which makes this year’s meteor shower a relatively tame one. On the bright side, the waning crescent Moon will not obscure the view. 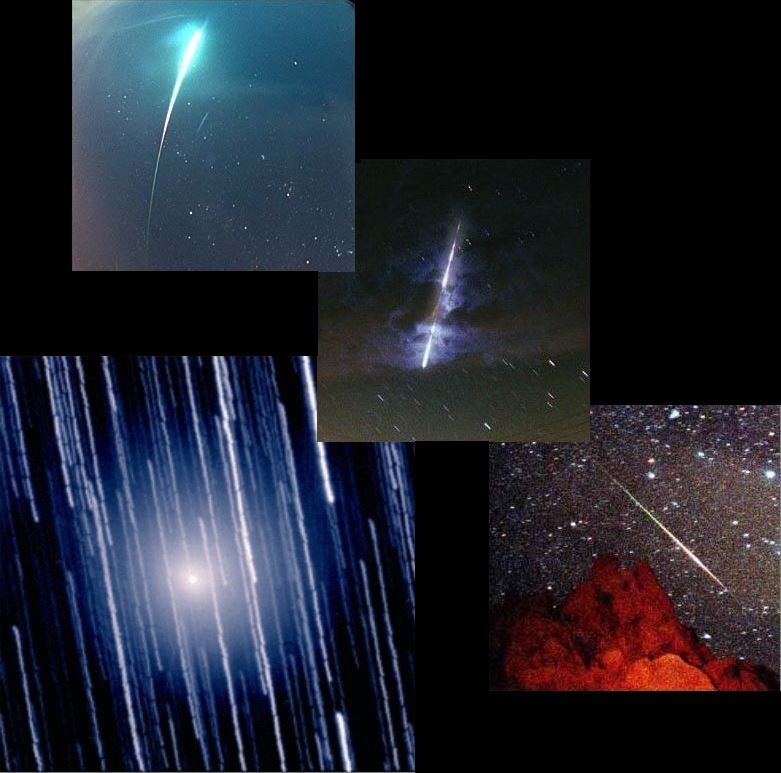 The Leonid meteor shower has produced some of the most spectacular meteor storms documented over the centuries. 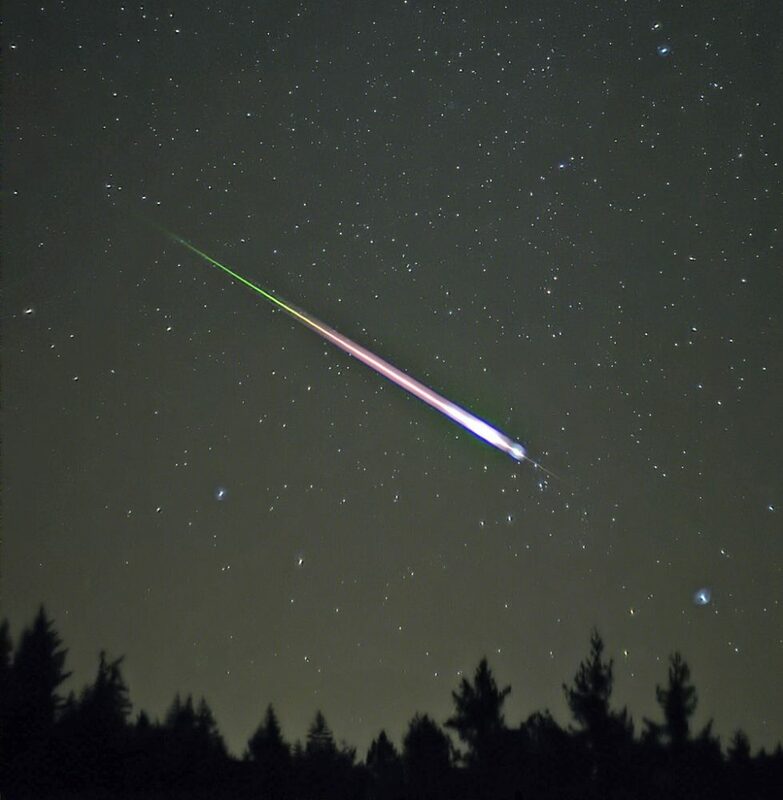 Meteor storms are large outbursts of meteors, producing more than a thousand meteors per hour. The most famous depiction of the 1833 actually produced in 1889 for the Adventist book Bible Readings for the Home Circle – the engraving is by Adolf Vollmy based upon an original painting by the Swiss artist Karl Jauslin, that is in turn based on a first-person account of the 1833 storm by a minister, Joseph Harvey Waggoner on his way from Florida to New Orleans. 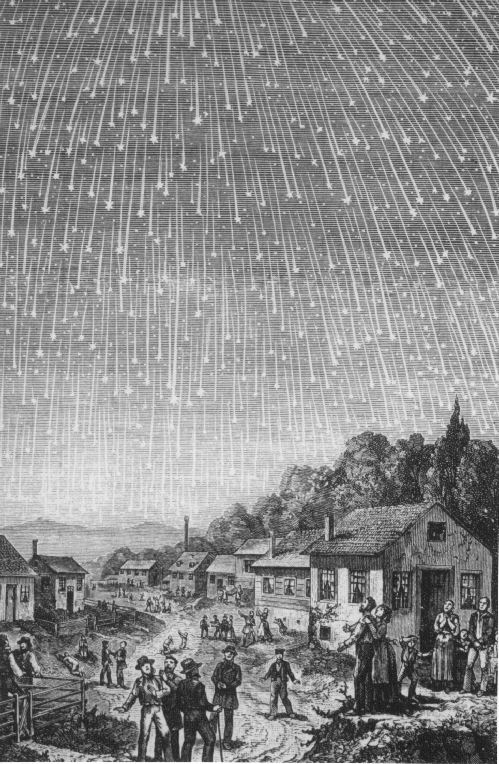 The great Leonid shower storm of 1833 provided scientists with valuable insights into the nature of meteors themselves, as they had previously been believed to be atmospheric phenomena. Estimates for the meteor storm of 1833 ranged from over 100,000 to more than 240,000 meteors per hour during the nine hours of the storm on the night of November 12 to 13, as seen from North America. The phenomenon was noted by abolitionists Harriet Tubman and Frederick Douglass and Joseph Smith, the founder of Mormonism, among others. The meteor storm was not a result of a recent passage of the comet Tempel-Tuttle, but of a direct impact with the dust trail left behind by the comet when it passed us by in 1800. Denison Olmsted provided the most accurate description of the 1833 meteor storm after collecting information about the event. He noted that it was not visible in Europe, did not last very long, and that the meteors seemed to come from a point in Leo constellation. Another Leonid meteor storm occurred in 1866, when hundreds of meteors could be seen per minute, and a few thousand per hour were visible in Europe. The 1866 storm was caused by the passage of the comet in 1833. 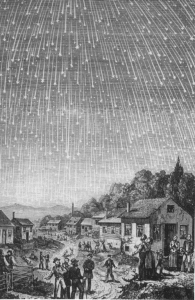 Leonids also made strong appearances in 1867 and 1868, with about a thousand meteors per hour at peak. 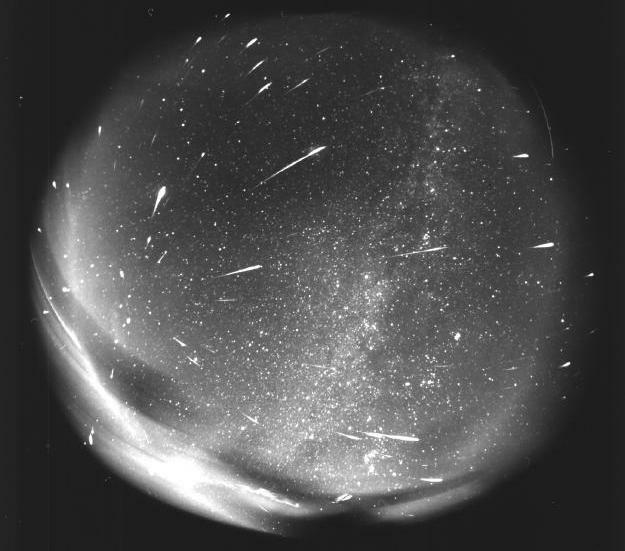 The last spectacular meteor storm was seen over North and South America in 1966, with 40 to 50 meteors visible per second, resulting from Tempel-Tuttle’s passage in 1899. After gathering historical notes, scientists learned that the Leonids had been seen as early as 900 AD. The comet Tempel-Tuttle was first pointed out as the source of the Leonids in 1866-1867. The comet was named after its discoverers, American astronomer Horace P. Tuttle and German astronomer Wilhelm Tempel. Tempel discovered the comet on December 19, 1865 near the Big Dipper and Tuttle found it independently on January 6, 1866. The comet Tempel-Tuttle takes 33.17 years to complete an orbit around the Sun.